Why we developed the Guerilla RampUp™ process, and how we work. We've been in this business a long time, since 1996. That's like forever in the internet age. 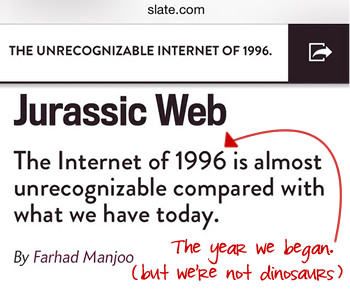 And although the internet has changed drastically since we started, designers haven't evolved with it. The typical designer is more obsessed with making something pretty or that might win them an award than they are with your business and how your website can (and should!) be an integral part of it. Projects drag out forever as the design goes through endless tweaks, and at the end you have something that may look great but doesn't do diddly to help your business. Not to mention the lost time and money. We know it's not really their fault, though. They haven't a clue how to help you with business strategy. We also know that you have to deal with the constant struggle of balancing the realities of life with running your business. That's part of our life, too. The aftereffects of a hiring decision made when our CEO was caring for her mother with Alzheimer's cost us lots of money and caused much stress. Combining these two problems, we realized we could help others who are facing major life changes avoid similar costly mistakes and do it in the focused, intense, strategic way that we like to work. AND guarantee it. The result is Guerilla RampUp™, an intensive process designed to uncover how you can use the web to meet your needs and goals, and develop everything you need to start transforming your business immediately. It's focused, strategic, and short - everything done in no more than 2 weeks. PLUS, you get an hour a month of free follow-up consulting for 6 months to help make sure you’re on the right track! If you find yourself needing to attract better clients or facing life changes like preparing to retire or caring for an elderly parent, we want to help you adapt your business to meet life's new demands rapidly. Every day of procrastination is a lost opportunity. Guerilla RampUp™ isn't for everyone, though. If you're a waffler, afraid of change, or just looking to drive tons of traffic, we won't be a good fit for each other. But if you're decisive and confident, seriously want to use the web to improve your business and lifestyle, and don't want to drag things out over months in a traditional design project, most likely we'll work well together. The initial Guerilla Brand Strategy Brief™ phase lets you get to know our CEO before you or we make too big of a commitment. You come out with a Guerilla Brand Strategy Brief™ that you can use to make changes yourself, hire another designer/developer, or move forward with us to Phase 2 - the Guerilla RampUp™. And we haven't had to worry about being sucked into a black hole project. We work directly with up to 2 decision makers during the Guerilla RampUp™, not a subordinate who would be a go-between. Projects cover a distinct time period but can be split between weeks to meet your schedule. Every project begins with a Guerilla Brand Strategy Brief™ to build on a foundation that will help reach your goals, not just look good. Meetings can be done via phone, Skype, or in-person at our office in Halifax, Virginia. We don't respond to RFP's. We don't work with committees. Our clients are business owners who are experts in their field and offer (or want to offer!) premium-priced services or products. If you're just looking for a designer who'll "make you a website," there are plenty of other designers who can create something that looks good. If you're serious about wanting to reimagine your business so you can reinvent your life, though, a 2-hour Brand Strategy Consult and Guerilla Brand Strategy Brief™ is your first step in working with us.